Radiohead “House Of Cards” - new 3D laser data video opensourced through Google! Radiohead have released the video for their new single “House Of Cards”, the latest single taken from "In Rainbows." Rather than produce a standard video with cameras though, Radiohead have tried something completely new with the "House Of Cards" video. Lasers were used to develop a bank of 3D data which has now been interpreted into film – a music video created without the use of cameras! “Geometric Informatics scanning systems produce structured light to capture 3D images at close proximity, while a Velodyne Lidar system that uses multiple lasers is used to capture large environments such as landscapes. In this video, 64 lasers rotating and shooting in a 360 degree radius 900 times per minute produced all the exterior scenes.” This produced a massive bank of data that was then interpreted into 3D imagery, put together and interpreted to produce the "House Of Cards" video. To finish things off Radiohead have released the data behind the "House Of Cards" video to Google. 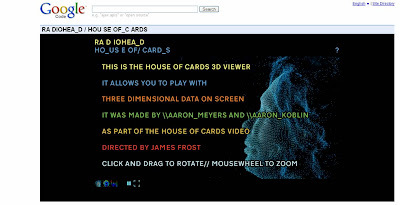 Google Users can either play with the imagery on the Google Code site here or can produce their own versions of the “House of Cards” video by downloading and manipulating the data behind the film. Users are able to download the CSV source code for Thom Yorke singing “House Of Cards” and the processing source code / Lidar data from the “House Of Cards” video from the Google Code blog. Google and Radiohead are then encouraging users to upload their versions to YouTube for everyone to see. There is also a Radiohead iGoogle theme that can be downloaded. This is the latest in a long line of interesting Radiohead digital initiatives (eg the New Years Eve online concert) and if Radiohead are now using data to produce 3D videos I'm intrigued to see what's next!